Take control of your membership data with unprecedented flexibility. Maintain all aspects of your membership activities and data, and leverage this insight to drive your email campaigns, events and automations intelligently. Our integrated membership organization software connects all the dots for you, and gives you the data you need on demand. Your community goes beyond dues-paying members, so why should your MMS solution stop there? Track sponsors, vendors, media contacts, prospects, industry leaders, newsletter subscribers, and pretty much anyone you want to be able to communicate with in a snap. Organize, categorize, and segment your contacts intelligently with our smart list builder, Build as many lists as you like with our intuitive query builder and access them across all modules, such as events, renewal automations, and campaigns. Our membership software molds to your evolving needs and can handle any structure you throw at it. Whether you are a single level organization or a multi-level, national, or international entity supporting chapters or company/representative relationships, with the need to manage several membership types, categories, pricing bundles, and membership expiry dates, our AMS can handle it all. Go beyond custom fields. Set up multiple profile views and layouts for different audiences. Build a flexible member directory where you can control each data point, from the listing, profile, and search fields. 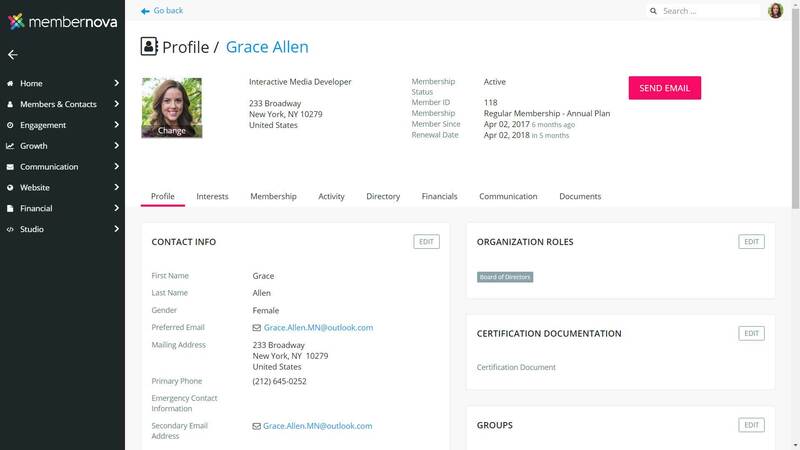 You decide who can access or edit which fields, profiles and listings based on role, membership type, or permission level, down to the most granular level. Automate the routine tasks of managing new membership registration and renewals. Set up membership subscriptions and rules and let our system do the work for you. 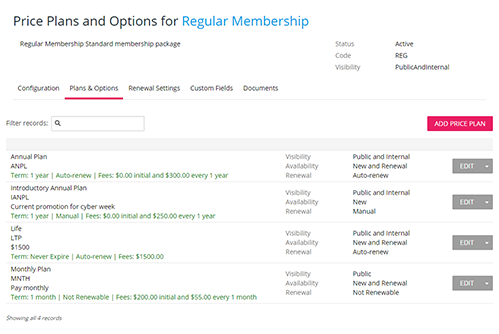 Structure different dues for each membership type, based on new or renewal payments, with recurring billing, installments, initiation fees, add-ons, and promo codes. Track finances and allow members to view their online account statements with invoices consolidated from all modules, including events and commerce, online payments, manual payment entries, and adjustments. Our AMS was built from the ground up to handle multiple entities and hierarchies, organizational memberships, sub-accounts, multi-person memberships, and more. Give your chapter admins a specific level of reporting and functionality but limited to the members in their chapter. View and administer all chapters from your central console, with aggregate reporting and vital metrics. 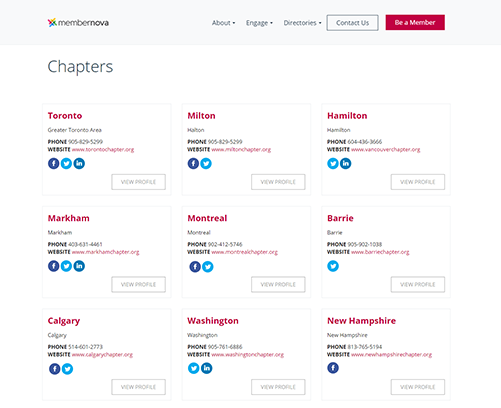 Publish a public chapter directory on your website showcasing their latest news, events, and members. Tailor the specific information you wish to display, and even create a specialized members-only view with links directly to their community management pages. Your members expect a modern, seamless experience when it comes to engaging with their association and fellow members. Adopt industry leading engagement and member success processes to give your members ROI from Day 1. From renewing their membership, to accessing benefits and resources, and even something as simple as updating their contact information, every interaction your members have with your association is an opportunity to strengthen your brand. 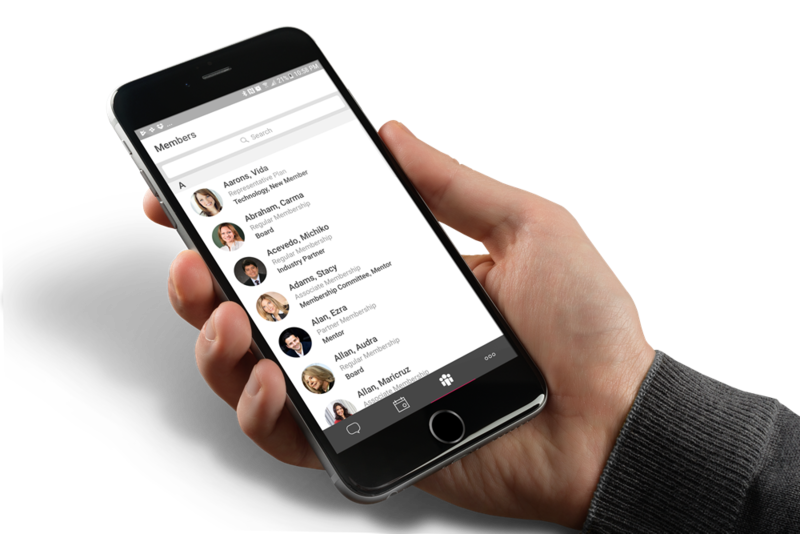 Make it truly easy for your members to gain access to the information they need on demand, right from their phone. Whether it's to register and pay for an event or training, looking up a member's phone number, updating their email address, or post a comment to their group forums, our association mobile app gives them the tools to find answers, share ideas, and connect on a more interactive level with your their association, which ultimately improves their experience and retention. Manage members of all types and level of complexity with chapters, multi-level structure. Gain insight on your members and better assess engagement. Create intelligent and powerful segments and smart lists to drive your digital strategy. Let members renew and pay their dues with ease, register for events, participate, log in to maintain their profile and more. Manage dues by offering annual, quarterly, or monthly membership renewals with flexible payment options. Set up automations that take care of membership renewals, send out surveys, onboard members, and more. Fully integrated member management, community engagement, and deep analytics. Bridge the communication gap between your members, contacts and community. Better engagement leads to a more inspired membership experience that will drive value and retention. Work on your member success strategy, not in it. Set up smart workflows that automate both repetitive and proactive actions to keep your organization humming seamlessly. Real-time analytics gives you instant access to actionable insight to help you measure your progress. Gain a full 360 degree view on your membership to stay on the pulse of what matters most.